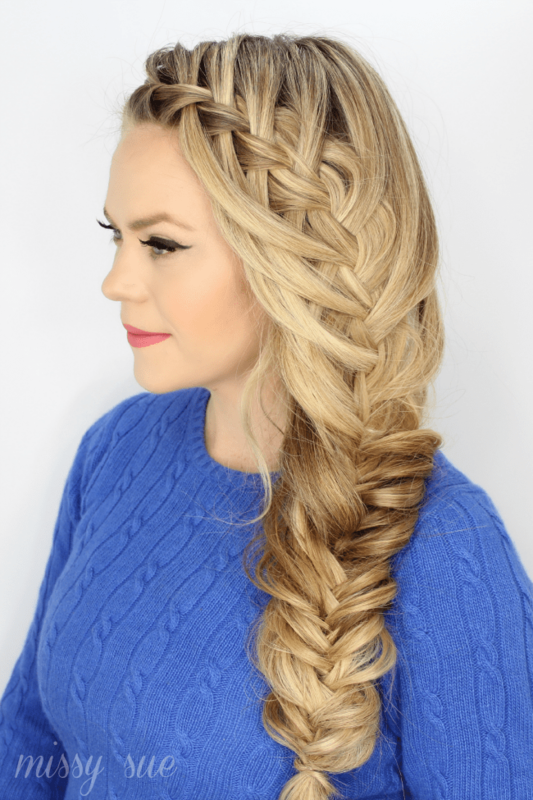 Fishtail braids are so trendy right now and absolutely perfect for Spring. 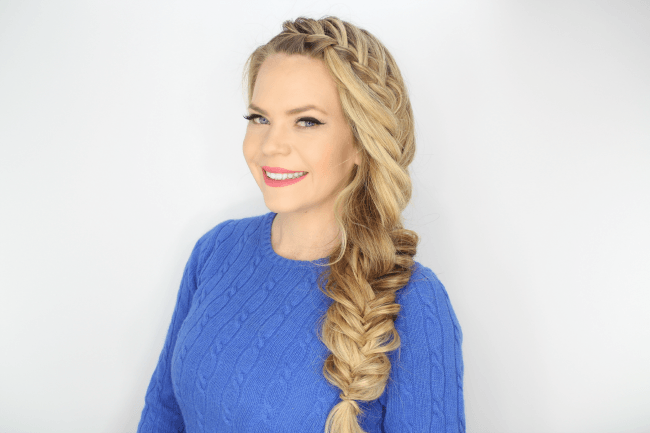 I have been obsessed with these waterfall styles, first in the Looped Half Up Crown Braid then the Cascading Waterfall Side Braid, so I really couldn’t resist putting it together with a fishtail braid. I recently wore it to lunch with my mom and posted a pic on instagram. It was such a hit I figured it needed its own tutorial. I hope you love it as much as I do! Step 1 / With a part on the right side, pick up a section of hair on the heavy side of the part and divide it into three sections. Step 2 / Cross the back strand over the middle then cross the front strand over the middle. Step 3 / Next, cross the back strand over the middle and bring in a section of hair incorporating it into the strand. Step 4 / Then, repeat step 3 with the front strand. Step 5 / Repeat step 3 once more with the back strand. Step 6 / Then, split the front strand into two equal halves crossing one half over the middle strand. Step 7 / Drop down the other half and pick up a new section of hair incorporating it into the crossed over piece. Step 8 / Repeat steps 5 through 7 until there are four waterfall strands hanging down. Step 9 / Now, continue the same steps, splitting the strand, crossing over half, picking up a new section of hair, but then bring in the first waterfall strand and incorporate it into the braid. Step 10 / Continue braiding, until it reaches the shoulder. Step 11 / Now pick up the rest of the hair so there are two sections. Step 12 / Braid the rest of the hair down into a fishtail braid and tie off the end with an elastic band. Step 13 / Gently loosen the sides of the braid to show the details better and create a more voluminous braid. Your hair is so beautiful and healthy looking! I cant get over it! It looks really thick, is it? And do you curl it everyday, or do you do “overnight curls”. If so, what system do you use? It’s very nice and beauty hairstyle! I will try to repeat! This is so beautiful! I look forward to trying it.